Belinda met Ruth Morris (a knitwear designer with a background of interpersonal therapeutic practice) through a chance encounter. This was the beginning of Belinda's knit-wear design life.... The hand-knit design company RUTH and BELINDA (the hand-knit design and promotion company) came to life - (more about Ruth and Belinda below). Through the dissecting and discussing; style, design, sense of wonder, technique, individuality, influence, improvised structure, unravelling and re-forming, dynamics, finding a rhythm, presentation, texture and colour, emotions and mood, the physical actions and styles of hand-knitting.We truly found our unique voice as hand-knit designers. What followed was unplanned but, looking back, appears pre-ordained and has exposed Belinda’s gift of designing contemporary, luxurious, beautifully constructed, knitwear/housewear that is delicious to wear/own, some would say transformative and of course utterly comfortable. 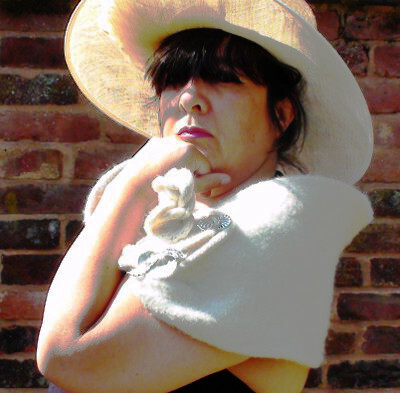 Our DESIGNS have been described as: strong, contemporary, ‘statement knitting’, classic and luxurious. We sell beautiful things that are based in a HAND KNITTING TRADITION. We find manipulating traditional designs exciting; to create, to knit, to wear and exhibit. 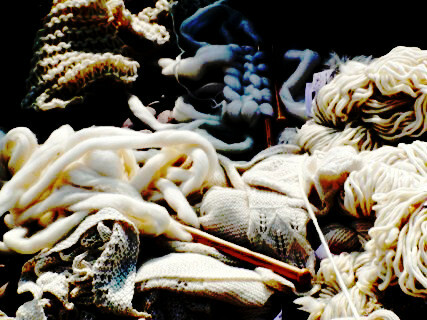 Our truly luxurious YARN is exclusively spun and dyed in the UK and Peru; exquisite, special, natural and soft. We design SHAWL-PINS and other LOVELY THINGS which are made by very skilled artisan makers. RUTH and BELINDA - the hand-knit design and promotion company came to life. They have recently been called ‘the dynamic duo’ (The Knitter - March 2013) and also the ‘glitterati of the knitting world’ (Simply Knitting – January 2013). They work closely with The Campaign for Wool - last year they were invited to knit a Union Flag on a train ride from King’s Cross to Edinburgh for Wool Week 2012 and also commissioned to design and knit the cushions for the Queen’s Jubilee celebrations on the Thames. Ruth and Belinda chose to branch into new avenues and re-present their own unique design ranges however they continue to host, motivate and mentor. They both hold firm to the principle of the individual's right to equality of opportunity and expression, regardless of perceived values of ability. 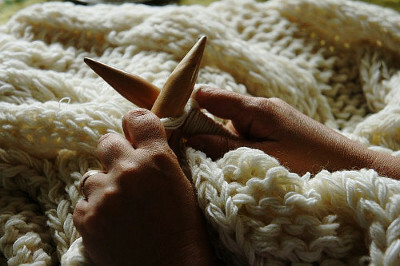 Knitting is skilled work, slow art, measured and precise; special. All our designs are handmade for you by a team of extraordinary women (and one man) all based in the UK – from Cornwall to The Highlands of Scotland aged 20 years old to 87 years old. Design makes ideas tangible; it takes abstract thoughts and inspirations and makes something concrete. Belinda thinks through making things; new ideas becoming real. Oh and designing is human-centred. Her focus is on how she can captivate the maker to be inspired by her offerings; she muses over and contemplates ‘knitterly’ solutions. How to meet a knitter’s needs? Finding simpler and better solutions ; seamless (in more ways than one) is the answer. Design is a fundamentally creative task. It takes time and space. It takes a certain kind of nourishment and focus. Yet at the same time, design is production and of course collaborative. It begins as Belinda's dream, Belinda's idea and the technical knowhow worked out on the needles, with the yarn. Then the designs are tried and tested, cut and sorted, re-written, re-knitted, more thought and then amended and simplified. "My work often appears organic but is in fact highly planned. Challenging preconceptions of knitting by combining traditional knitting designs and stylistics and re-forming them into interesting shapes that are wearable - this excites and delights me. This pragmatic process of making the designs simple and smooth and then have the fortunate position of astute and canny knitters trying them out means that the designs are as near perfect as she can make them. It is an honour to work with such an incredible team of makers. Their skills and patience is astounding; anything that is too complicated to understand or communicate is soon exposed.